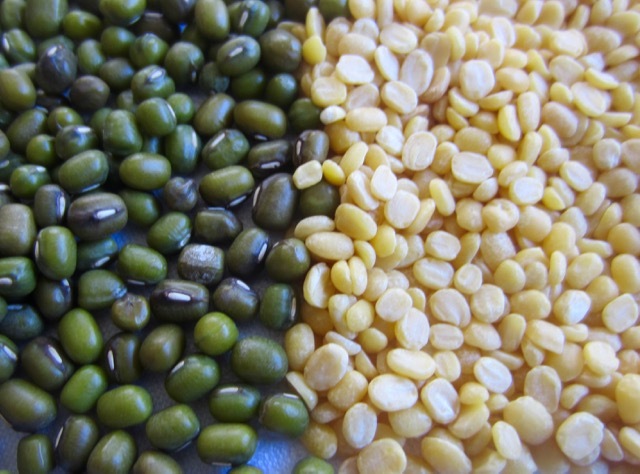 What is Green Gram (Mung, Moong Bean)? Green grams are the small green edible seeds of the plant species Vigna radiata. 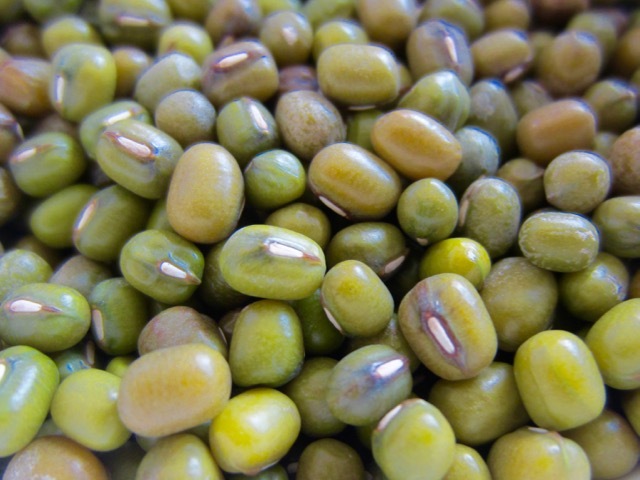 Green gram is closely related to Adzuki bean (Vigna angularis), and Black Gram or Urad Dal (Vigna mungo). Below is a photo of whole green grams on the left and split skinless green grams on the right. Both the whole and split seeds can be used to make soup. Green gram, originated in India where it has been cultivated for millennia. It spread, in early times, to other Asian countries and later to Africa, Australia, the Americas, and West Indies. India is the largest producer, followed by China. It’s also grown in many tropical African countries. Which Part of the Mung Bean Plant is used? The mature whole or split seeds are used to make soup (Dal). The immature pods and young leaves are used as a vegetable. The split seeds have their green testa removed and are pale yellow in colour. They can be toasted and ground into flour, called the gram flour (please do not confuse this with chickpea flour which is called Besan). They can also be toasted or fried and used as a snack and starch can be extracted from ground split seeds. Green gram can be used used in both sweet and savoury dishes. it can also be used for extracting starch or ground into flour called green gram flour or green moong dal flour. Whole seeds: in Africa, whole seeds are boiled with maize (corn) or sorghum and eaten as a nutritive meal. 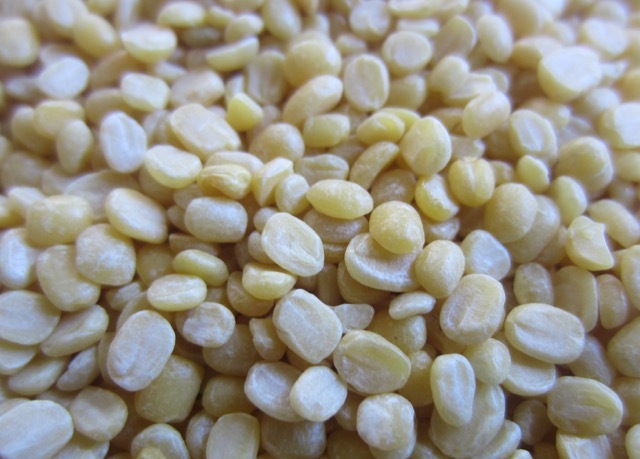 Whole seeds: are used in India and pakistan to make dal (green gram soup). The soup is called Sabut Moong Dal, Green Moong Dal, Whole Green Mung Dal, or Whole Green Moong Dal. It is served with rice or chapati or naan. Whole seeds can also be cooked with meat, prawns, fish, vegetables or in sauces, and served with chapati or rice or seasoned with spices and freshly grated coconut. The Split skinless seeds: the dried split seeds are pale yellow in colour and are called, dal or dhal. 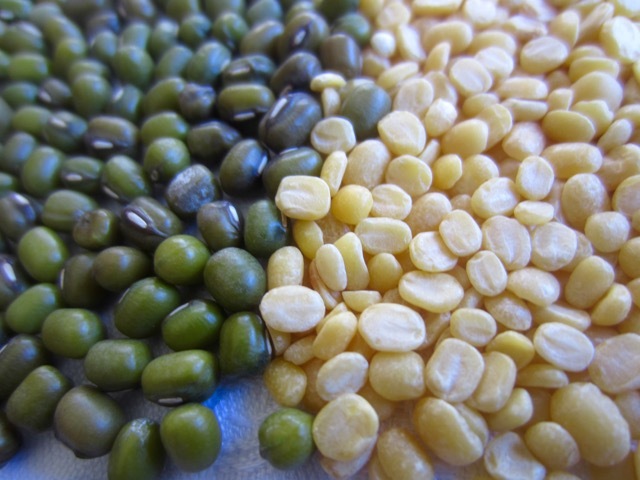 In India and Pakistan the split seeds are cooked as dal (green gram soup or sauce). The Split skinless seeds can also be fried and salted and eaten as a snack. Cooked split seeds can also blended with liquid, sweetened and served as a beverage. Mung Bean Starch: is extracted from ground mung beans and is used to make transparent cellophane noodles also called bean thread noodles, bean threads, or glass noodles. Immature pods and young leaves are eaten as a vegetable. Annual herb up to 1.3m tall. Leaves alternate and 3 (-5)-foliate, dark green in colour. Seeds 2.5-4mm x 2.5-3mm, commonly green in colour but sometimes yellow, olive, brown, purplish or black depending on the type. Two main cultivated varieties are usually distinguished based on seed colour. 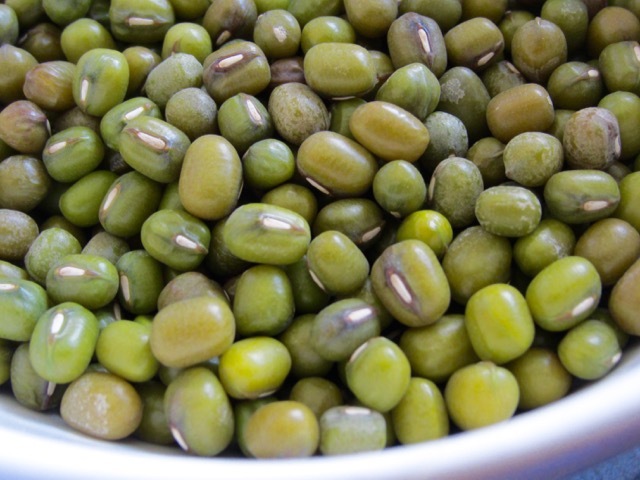 Green gram: has green seeds and is the most widely cultivated and used. Golden gram: has yellow seeds but the yields are low so it’s often grown for forage or green manure. There are also other types with black or brown seeds but these are not as common. Learned something new today! Love these learning snippets.